Steve Berry is a popular American author of his Cotton Malone historical adventure novels. He also wrote several similar style standalone books as well. Here are the Steve Berry books in order for his series and his standalone novels, listed by year of publication, and order of reading in brackets. Steve Berry (website) is an American author of several books written today, many of them as part of the popular Cotton Malone thriller series. He was born in 1955 in Georgia where he was also raised, Steve Berry is currently living in St. Augustine, Florida. He graduated from the Walter F. George School of Law at Mercer University, after which he became a trial lawyer. He held this position for 30 years, out of which he kept the elective office for 14 years. Steve Berry is the perfect example of the motto ‘never give up trying until you succeed’. He started writing fiction novels in 1990 and it took him no less than 12 years and being rejected 85 times with his 5 manuscripts before he finally got published by Ballantine Books in 2003 with The Amber Room. When asked how did he not simply give up after all these rejections, he said that a lot of credit is due to the Catholic school nuns who taught him discipline and perseverance to write novels and search for a suitable publisher for his works. Of course, the fact that the world became ripe and ready for his work had also something to do with his luck. 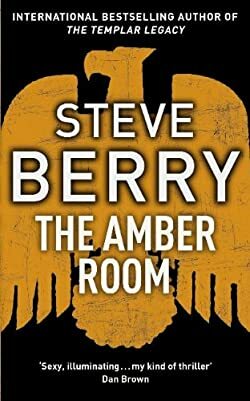 He openly admits that Dan Brown’s Da Vinci Code was the book that made publishers seek other works that complement it, and The Amber Room easily fit that classification. And it became published and it became a hit. And soon other books followed. His books have so far been published in over 40 languages selling in 51 countries, and the author has so far over 18 million books published overall. The author Steve Berry worked as a lawyer until 2008. It was after were here 8 Steve Berry books published that the author finally retired from his daytime job to write novels full time. In addition to writing books, Steve Berry is also a founding member of the International Thriller Writers group which includes over 2600 authors coming from all corners of the world. He was also co-president of the group for 3 years. With his wife Elizabeth, Steve Berry has also created the foundation called History Matters dedicated to preserving historical treasures, which is one of his main loves in life, a love that he shares with his wife. His work in historical preservation has been recognized several times, with the American Library Association naming him a spokesperson for National Preservation Week both in 2012 and 2013. While his Cotton Malone series is most popular of his fiction works, he first started writing standalone thriller novels including The Amber Room, The Romanov Prophecy, and The Third Secret. The Romanov Prophecy was, in fact, the first book I’ve read by the author, which invariably led me to his famous adventure thriller series. The Templar Legacy, his first Cotton Malone novel, was declared by a 2010 NPR survey one of the top 100 thrillers ever written. Currently, the Cotton Malone historical mystery/adventure series includes 14 main books and a few short novellas. The Bishop’s Pawn is published early 2018, and as usual, it features Cotton Malone dealing with an ancient historical puzzle. This time, the case revolves around Martin Luther King, Jr.’s assassination, which was also the very first case Malone investigated some 18 years ago, where the story takes the reader back as well. The revelations about the American icon’s assassination are so explosive that they could ruin a lot of lives, including some innocent ones. Still, Cotton Malone wants to see the case through to the very end. 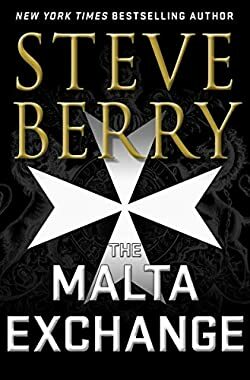 In The Malta Exchange, Malone enters the world of the Vatican with its corrupt cardinals, he meets rogue Maltese Knights and is on the trail of those famous letters between Winston Churchill and Benito Mussolini. Even though Cotton is now a retired spy and current rare bookseller, he won’t stay away when a new, dangerous mission presents itself to the team. The Steve Berry Cotton Malone character is a former Justice Dept. operative who now is the proud owner of a bookstore in Copenhagen in Denmark. While he wants to lead a quiet life with his books, Malone invariably gets drawn in back to the old and dangerous situations he used to be involved in as an active operative. Cotton Malone is a very ordinary guy thrown into dangerous situations. Steve Berry basically modeled him after his own character, except the author doesn’t’ shoot guns or puts himself into perilous situations that Malone always finds himself into all the time. The author had the first idea for him while he was sitting in a cafe in Copenhagen. One could say that Cotton Malone was born in Denmark. For his books, Steve Berry does a lot of research, often half a year of research even before he sits down to write the novel, followed by additional months of heavy research. The author likes to keep as close to true life as possible, even though his books are all fiction. The Steve Berry book list in chronological order includes all the Cotton Malone novels as well as his historical adventure standalone books. The author has also written three separate novellas, one in collaboration with James Rollins, published as The Devil’s Bones, the second one, another short novella titled The Devil’s Due, and the third, Past Prologue, in collaboration with the famous time-travel romance author, Diana Gabaldon, known for her Outlander series. In fact, this book is a merging of two worlds: Diana’s Outlander world with Berry’s current Cotton world, where Cotton Malone gets to meet first-hand the dashing Jamie Fraser.